To influence effectively, a leader must be adept at getting its opinions and ideas heard, recognized and considered by others. A key behaviour of effective leaders is the capacity to influence those around them towards acceptance of beneficial outcomes. Influence inherently means that the individual is able to impact the ideas, opinions and actions of others. When a leader influence effectively he/she increases trust, support and ownership for his/her priorities. The Influence Style IndicatorTM (ISITM) is an assessment instrument designed to understand an individual’s preferred style as they influence others. The assessment addresses one’s preferred, secondary, and underutilized influencing styles. Why influence matters in a leader? Today’s workplace is characterized by levels of change and complexity that are unprecedented. Workplace realities such as identifying shared goals, leading complex and often dispersed teams, boundary spanning, coordinating matrixed projects, and integrating diverse people and interest require the capacity to influence others in a way that has a positive and unifying impact. Whether an individual is leading, following and/or collaborating, chances are he will need to influence others to be successful. The ability to influence effectively is emerging as a key leadership skill for a new generation of leaders. 1) Advocating: Individuals put forward ideas and offer logical and rational reasons to convince others of their point of view. 2) Uniting: Individuals advocate for their position by encouraging others with a sense of shared mission and exciting possibilities. 1) Rationalizing—Using logic and reasoning to present your ideas. 2) Asserting—Stating preferences clearly and applying pressure. 3) Negotiating—Compromising and making concessions to find common ground. 4) Inspiring—Influencing others through shared purposes and broader possibilities. 5) Bridging—Engaging and connecting with others. Why use the Influence Style Indicator®? 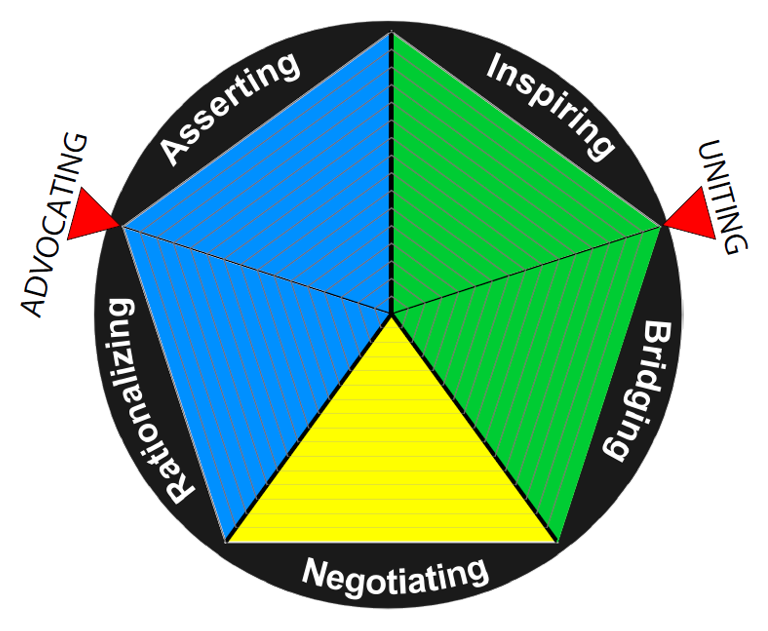 Learn about five unique influencing styles: Rationalizing, Asserting, Negotiating, Inspiring and Bridging. Understand when each influencing style is best used and what the potential pitfalls may be. Examine what their chosen influence style looks like to others. Determine best opportunities to flex their style to address a variety of situations. Improve their ability to connect with others using a variety of influencing styles. Investigate how timing and discretion are important considerations in influencing. Reach an understanding of how influencing styles can impact organizational decision-making. Be able to identify others’ preferred styles. Highlights an individual’s preferred style in influencing others, whether they rationalize their viewpoint, assert their opinions on others, negotiate with those that are being influenced, inspire others to agree with them or use bridging as a strategy. The respondents not only become aware of their influencing style but also receive valuable resources for how to maximize their effectiveness in a given situation and tips on how to improve their underutilized styles. Measures a team’s dominant influencing style with additional information regarding its group dynamics such as team dominant and under-utilized styles.